Before revealing the new features, we would like to apologize to Safari users – we weren’t aware until recently that you didn’t had any access to the community page nor the brokers page. We’re glad to inform you that our technical team has made the necessary changes and tested our platform to be 100% compatible with Safari. We are working on even more features as requested by our members, so please be patient as we create them. Also, don’t forget to cast your vote on a suggestion, as features are prioritized by your votes. 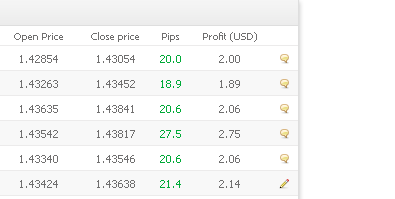 Posted in Myfxbook Updates | Comments Off on 6 new features! Update and one new feature! This has been a long week for us! Many bugs were reported and fixed, and several interesting suggestions were recieved which we have already started to work on. We would like to thank all of our members for helping us to improve our platform, and please do keep reporting the bugs we’ve missed. We would like to present the first major feature we have just released (special thanks goes to Elkart! ): Automatic twittering of your trades! 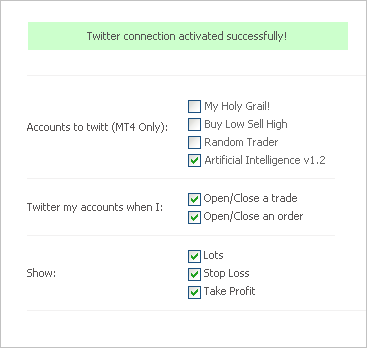 All you have to do is enable twitter in your settings tab, select the account you want to twitt, and every trade or order you’ll make in your MetaTrader 4 platform will be published on your twitter account automatically. 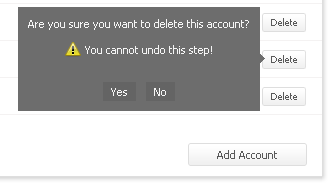 Do note however that any deleted system’s data is not recoverable. Posted in Myfxbook Updates | Comments Off on Update and one new feature! You are currently browsing the The Myfxbook Blog blog archives for August, 2009.